It looks like Superman should be running alongside it. Talk about classy! Yeah, it was quite the thing ... built by an aircraft manufacturer, even! 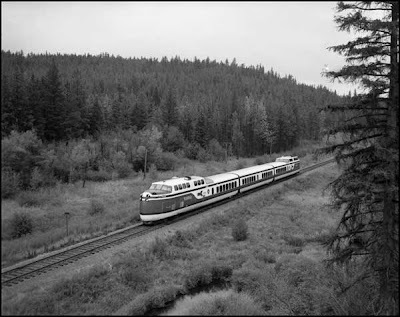 'd love to see the trains come back, too ... though the way Montana is it would be hard to use them for local trips. Most of the state is always going to be a long ways from a set of railroad tracks -- most of the Costco's included! I vaguely remember a class trip to visit the Freedom Train when it came through Great Falls in 1948. Many of my mates had never been on a train...not many parents even owned a car at the time. Mom didn't get her first car until 1949, when she was 35. It was a '37 Pontiac coupe, Grampie bought for her...we left Montana for the coast, to begin a nomadic Gypsy life. I never rode another train, until I went to Ireland. I've ridden a good chunk of the Amtrak network since then, and trains in a number of other countries, as well. The experiences have usually been great, and nearly always memorable ... even my Irish train ride, which was late enough to make me miss a flight.